Stockshop Healthy Pen works in many distinct ways. It's natural enzymes work as a natural cleaner, eliminating odours and organic contaminants. Amonia NH3 is extremely harmful to the respiratory system of birds and Healthy Pen helps to eliminate this problem. 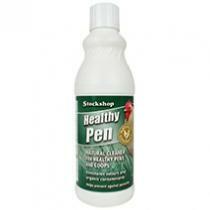 Healthy Pen also acts as a barrier to flies and other parasites as its natural oils are a natural repellent.